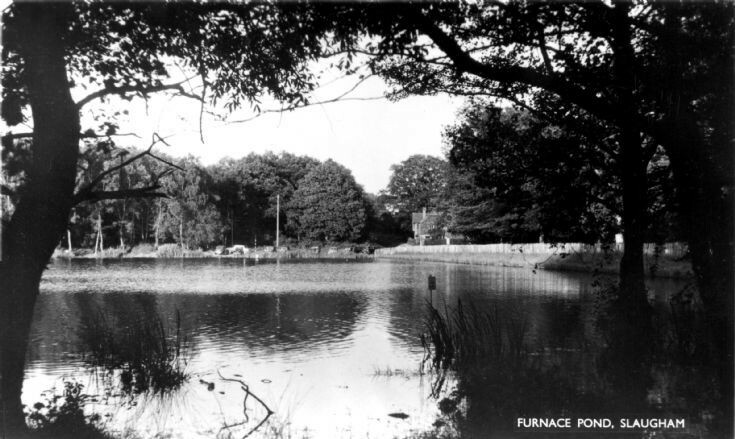 The photograph of the Furnace Pond in Slaugham has been taken from the west bank which is in the parish of Lower Beeding. Across the water in the parish of Slaugham the car park seems to be quite full, but it is not easy to determine if the vehicles belong to anglers or day-trippers. I can remember the bank running along the top of the dam being cleared of trees and bushes in the 1960s and the new chestnut fencing being installed. I seem to recall that this bank was closed to the public except for members of the Slaugham Angling Club.